Snarkfest: Another Mother's Day post? 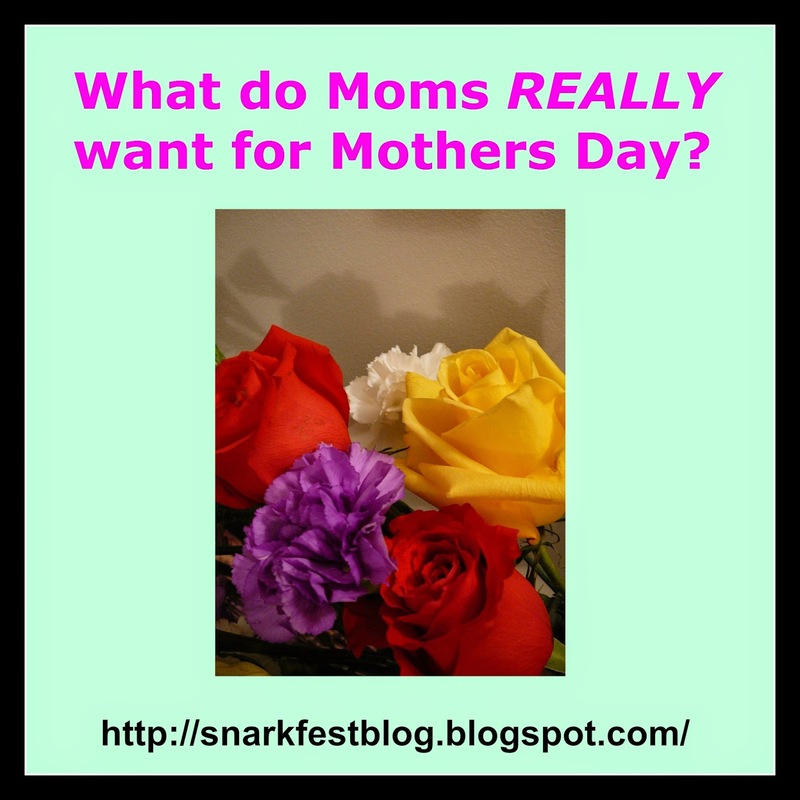 Gather round, Snarklings, I'm going to school you on what it is we moms TRULY want for Mothers Day. And every other day, for that matter. It's not rocket science, you don't need a degree, there's no deep, dark secret that you need Tom Hanks to help you unlock. It's fairly simple. Now keep one thing in mind. I am NOT speaking for all mothers everywhere around the world, This is just MY opinion as a mom. We love our children with every fiber of our being. And we want to spend time with them, we want hugs and loving from them. But being their mother does not define who we are. We were women first, before we became mommies. We had lives, we had friends, we had interest that didn't include stuffed animals, bugs, drama and messy rooms. Sometimes we like reminders of that time, a time before we had a 24/7 responsibility to be the caretaker of another life. Perfume fades, flowers die but memories last a lifetime. Memories make us smile when we are down. We want memories, both of time spent WITH our children AND without. Last year, I had the pleasure of spending Mothers Day weekend with some of my best girlfriends. We laid on the beach and watched dolphins swim just off the coast, we watched pelicans diving out of the sky and into the ocean and said "Nerrrrrmmmm" with each dive. We drank beer, we ate fattening foods, we laughed and most of all, we made memories. Do these memories take precedents over the memories I've made with my own babies? No, they do not. But what those memories DO for me is to remind me that I'm more than just a mom. I'm a girlfriend, a confident and a woman. I'm the band booster VP, and the PTO secretary, and the band banquet coordinator, and the office administrator, and the transportation to activities, and the money tree when my girls need spending money. I'm a lot of things to a lot of people. But I'm also a source of support and strength for my girlfriends when they need me. I'm also a daughter to an ailing mother, I'm a person who sometimes needs the support and strength of others. Sometimes I need to be around people who DON'T depend on me 24/7 to remind me that I'm not alone in this motherhood gig. Being around others who share my struggles, my joys and my sorrows helps me to come back and appreciate the person I've become. The mother, the wife, the community member. So what do I really want for Mothers Day? I want to be able to love my children, and have permission to love and spend time with my friends as well. I don't want guilt for being away. I don't want hurt feelings as a result of my choices. Being allowed to go and spend time with my friends, overall, makes me a better mom, a better person. It makes me appreciate what I have in my life. And when I come back home, and I wrap my arms around my babies, I know I'm a better person for having them in my life AND my girlfriends in my life. For having one without the other, I am not complete. Yes!!! Scream it from the roof tops! Good girlfriends are the bomb. Great kids are ok...but really good girlfriends?? Well, they're the shizz. Girl....I hear ya. I used to have a beach weekend with the Gals on Moms day. I would always try to be back for dinnertime. I think it is one day out of the year that is should be about us and what we would lime to do without feeling guilty. However, when the kids grow up and move out it tends to be a lil different. NOW...I think sometimes where are my lil angels on Mommy's day....smile and be happy and know that one day your daughters will have the same feeling and that you will be OK with however they honor you on Mothers Day when they have lil ones. Hope you had a fantastic Mother's Day Teri!